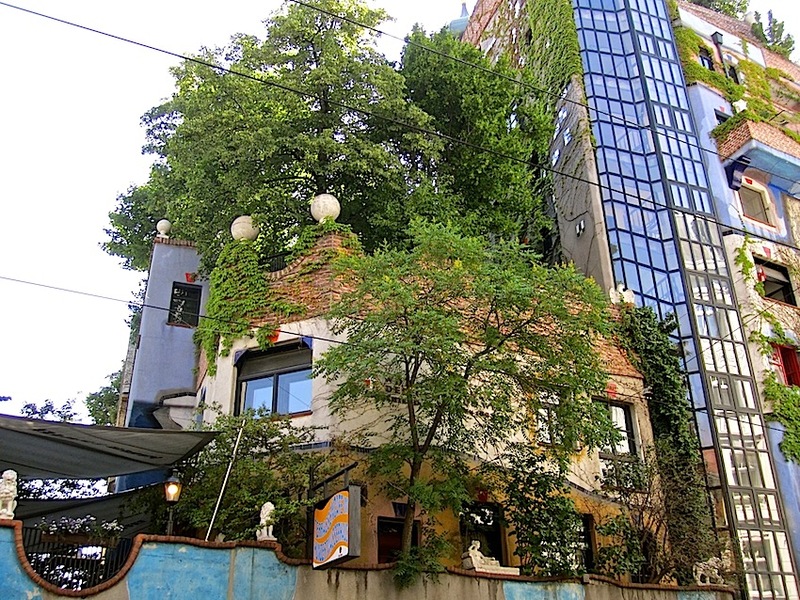 This is the Hundertwasser House in Vienna, Austria, an apartment building designed and constructed in the early 1980s from the concepts of visionary Austrian artist Friedensreich Hundertwasser. Kegelgasse, the bermed pedestrian street below the photo above. 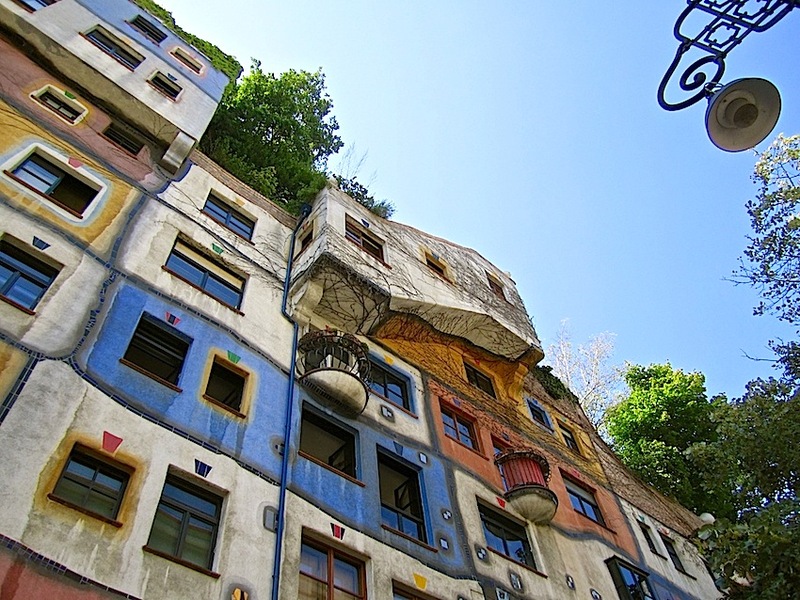 Friedensreich Hundertwasser† was a painter and later worked in the field of applied art, creating flags, posters, and stamps. 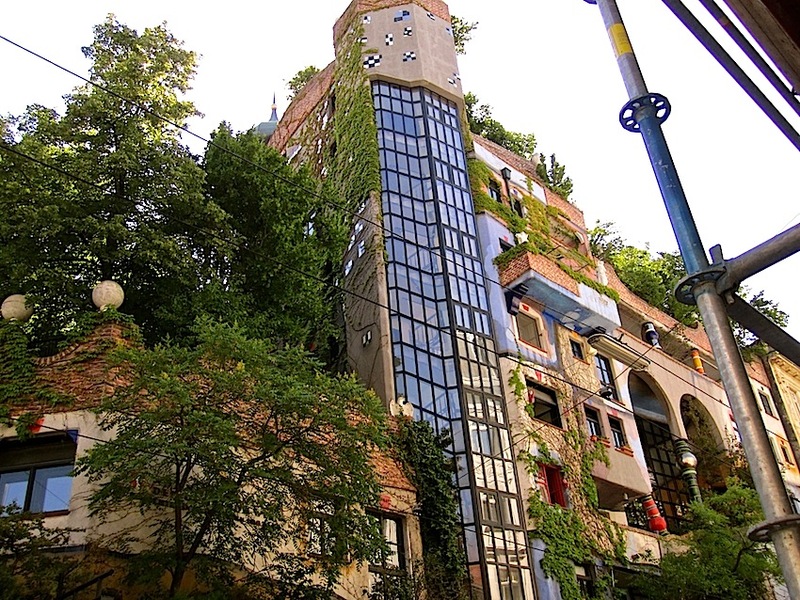 He wanted forested roofs, “tree tenants” on balconies, and “high rise” meadows. 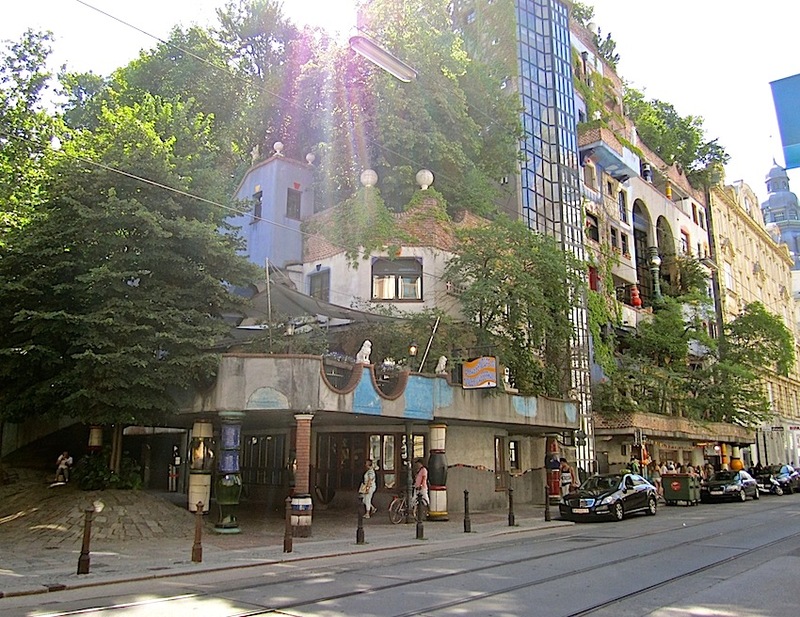 In 1977, the mayor of Vienna was persuaded to give Hundertwasser a chance to try out his ideas on an apartment building. An architect (and then another) was assigned to help him create the technical drawings. Beyond the fountain above, the quiet internal courtyard of the building. 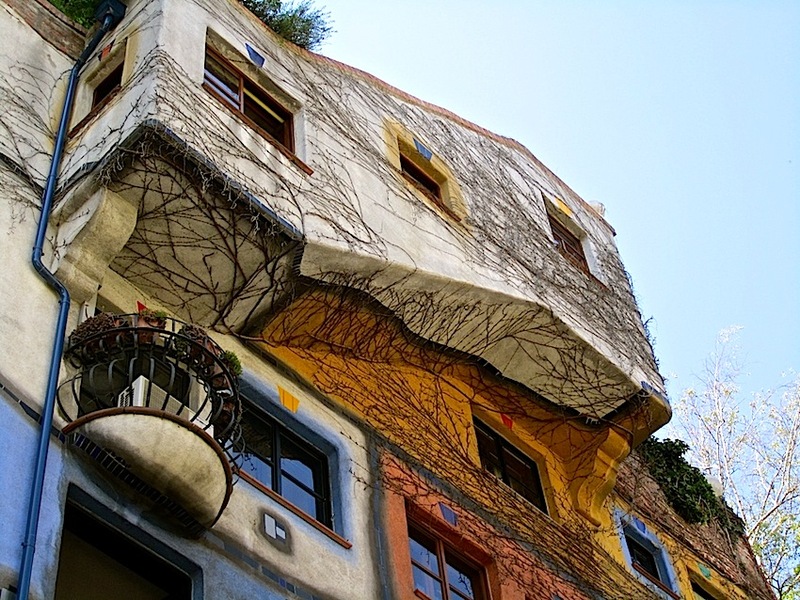 In 1980, at a press conference about the Haus, Hundertwasser expressed his philosophy of “window right” and “tree obligation.” You can read it here. Some of his other statements about the building are below. “Windows in rank and file are sad, windows should be able to dance.” — F.H. Photos above and below: The facade of the north side. 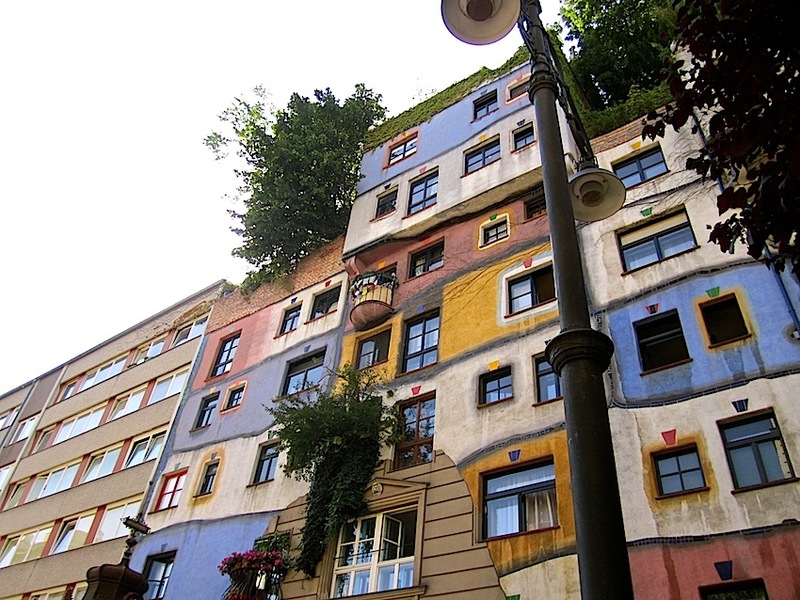 Hundertwasser believed that every tenant should have the right to choose the decoration around his or her own windows. In a[n apartment] house, an individually different, organic design of the outer wall of each individual apartment is of fundamental significance, so that the resident can identify with his house from the outside. [The terraces] open to the street are a gift for everyone . . . . [They] take away the house’s vertical aggressivity, street noise is lessened because the echo is no longer caught between the rows of buildings. If the terraces are green and have trees on them, it is like a natural hill with people living in it. Walking through a city with ascending terraces is like wandering through a gentle, green valley. Photos above: The pedestrian street along the north side of the building. A lively, uneven floor in the public area means a regaining of the human dignity which man is deprived of by the levelling tendencies of urbanism. . . . If modern man is forced to walk on asphalt, concrete FLAT surfaces, the way they are thoughtlessly conceived with the ruler in the designer offices, alienated from his natural relationship to the earth which goes back to the dawn of time, from contact with the earth, a crucial part of man is blunted, with catastrophic consequences for his psyche, his emotional balance, his well-being and health. Man forgets how to experience things and becomes emotionally ill. Thus, the flat floor becomes a true danger for man. The building contains 52 apartments, 16 private terraces, 3 communal terraces, and 250 trees and bushes, according to Wikipedia. To scroll through larger versions of the photos, click on ‘Continue reading’ and then on any thumbnail in the gallery. *The 1 tram starts out in front of the Opera House and moves along the west and north sides of the Ring Road. Just stay on until it veers off east on Radetzky Street. 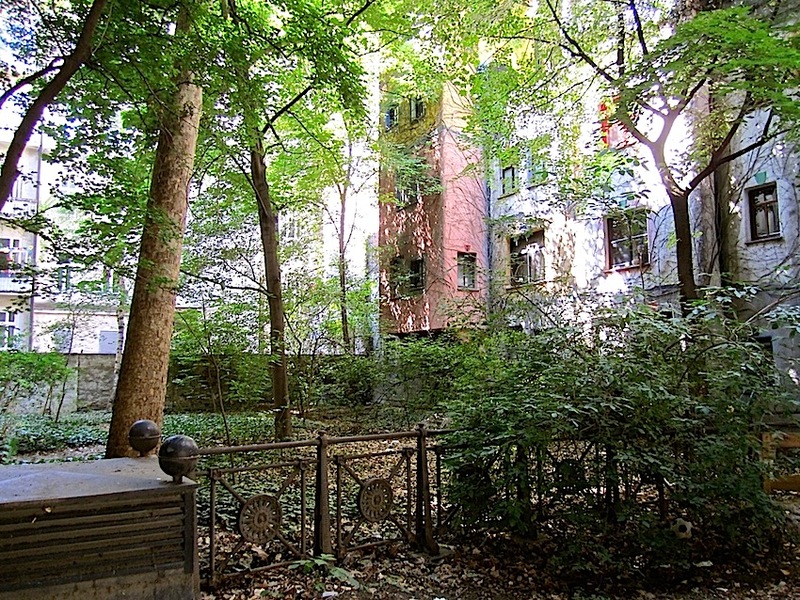 Hundertwasserhaus is on Löwengasse — on the left — right after you cross Blütengasse. †He was born Friedrich Stowasser, but changed his name in the late 1940s. 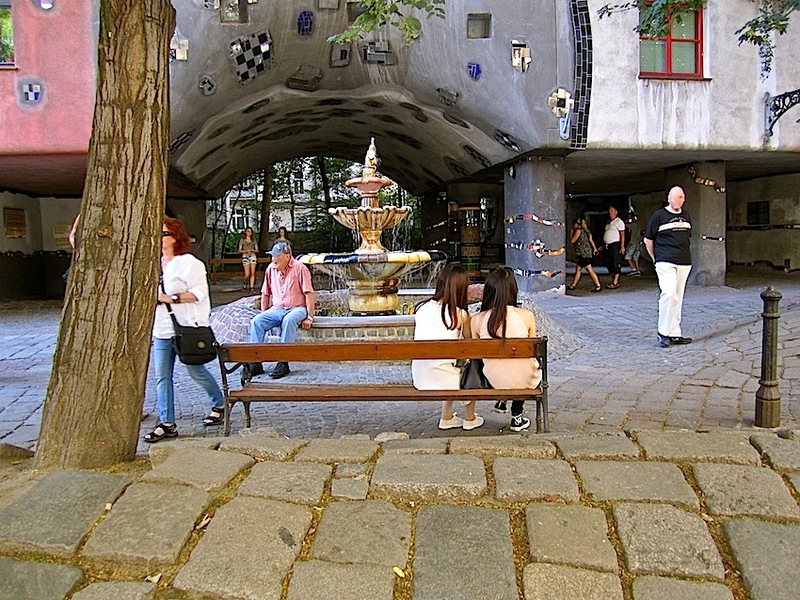 His adopted name translates as “Peace-Realm Hundred-Water.” He died in 2000, after working on a number of architectural projects in the 1980s and 90s. This shows that it is possible to build homes with a spirit. Thanks for sharing!! !